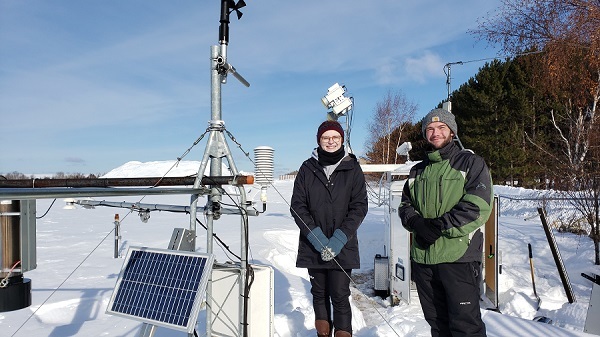 A delegation from the City College of New York will visit Aroostook County on April 3 and 4 as part of the weather research efforts that have been undertaken in northern Maine over the past decade. The University of Maine at Presque Isle began collaborating on this weather research in 2012 and will help to host the delegation during its visit. The Aroostook Band of Micmacs has been collaborating with the CREST team since 2016 and is also helping to host the group. The delegation includes CCNY President Vincent Boudreau; Executive Director, Combined Foundations for City College Dee Dee Mozeleski; Director Reza Khanbilvardi; Assistant Director Shakila Merchant; UPRM faculty Jonathan Munoz; and Senior Scientist Tarendra Lakhankar from the National Oceanic and Atmospheric Administration Cooperative Science Center for Earth System Sciences and Remote Sensing Technologies (NOAA-CESSRST), also known as NOAA-CREST. The Center is led by The City College (CCNY) of the City University of New York (CUNY) and brings together a national consortium of minority serving partner institutions from five different states. While in The County, the delegation will meet with community partners and share information about CREST outreach programs. As a special outreach to the community, the delegation will host a gathering at the CREST Snow Site at the National Weather Service office in Caribou. During this gathering, which will take place on Thursday, April 4, the group will launch a weather balloon at 11 a.m. Local students and community members will be in attendance to witness the launch, which will help them to learn the science behind weather and forecasting in a very hands-on way. In addition, a group of high school students will be conducting some hands-on studies with snow at the site ahead of the launch, weather permitting. Members of the media and public are invited to attend this event. The CREST-SAFE (Snow Analysis and Field Experiment) Snow Site was established in 2010 on the premises of the Caribou Municipal Airport and National Weather Service office in Caribou. The $1 million snowfield site—made possible by funding through New York State and federal (Department of Defense and NOAA) agencies—is the only facility of its kind in the United States. 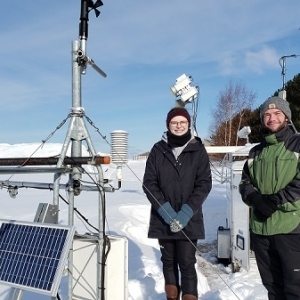 Using sophisticated instruments, the site collects long-term microwave and surface observations of snow during dry, wet, and melting snow conditions in real-time. This data provides critical information about snow pack, so that forecasters can better assess the flood risk, and communicate that risk to emergency managers and the general public. UMPI students have been engaged in the snow data collection since the installation of the equipment in 2010. In addition to this work, the CREST team has successfully created an education and outreach partnership with The Aroostook Band of Micmacs. Plans are underway to conduct a one-week STEM outreach camp in Summer 2019, where CREST scientists and students will engage K-12 students in water and weather-related STEM immersion programs. For more information about this visit, contact Dr. Shakila Merchant, Assistant Director of the NOAA-CREST Center, at 347-730-2008.